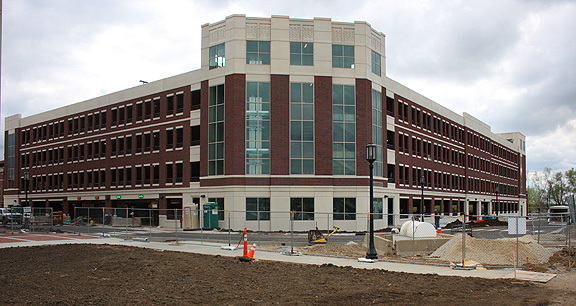 Project obstacles and solutions: The Harrison Street parking garage is a five level facility that serves students, faculty and staff in the heart of the Purdue University campus. The garage relieves the limited street parking in the area and provides 850 parking spaces for four large buildings. There were several challenges with this project. First, the structural engineering of a garage this large has to be precise. Not only is concrete strength at issue, but the interaction between concrete chemistry and steel is critical. IMI used a corrosion inhibitor as an admixture in the ready mix concrete supplied to the job site. However, corrosion inhibitors also speed up set times of concrete. To keep the concrete workable, IMI delivered it between 3:00 a.m. and sunrise. Wilhelm Construction had the concrete pumped onto the site. Another obstacle was achieving strength quickly. The project was under very tight deadlines and the decks were fitted with post tension tendons. The engineering specifications called for the tendons to be stretched after the concrete had reached strength 72 hours after each deck pour was completed. To make up for lost time, IMI QC/QA personnel went back to the lab and tested a mix that would accelerate the maturity of the concrete. They worked with Wilhelm and the engineers to design a mix that would reach strength in 24 hours without compromising other strength considerations. IMI delivered over 10,000 yards of concrete for the Harrison Street garage. The project included all of the pillars, beams and decks of the structure. It also included cast-in-place stairways and elevator shafts.